Eusebia proudly proclaims the good news. The good news is simple: God is real, God will make a real difference in your life, and as a result, you can experience real community. Though our congregation is diverse, we are united by a common life-changing experience with Christ. You can experience the difference Christ makes too, regardless of your background or situation. Eusebia doesn't just preach the good news for a few, we proclaim the good news for everyone: For saints and seekers. For individuals and families. For those more or less fortunate. For young and old. For people of all races. For blue collars, white collars, and no collars. For Seymour locals and refugees. 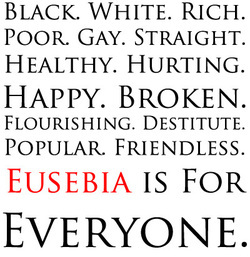 At Eusebia, the good news is for everyone. We walk with each other in life and ministry. For more than 200 years Eusebia has proclaimed the good news to all people--to the British, Scotch, Irish and French colonists of America, to the indigenous peoples of of the Appalachian mountains. Without moving, the Eusebia has preached the Gospel in North Carolina, The Cherokee Nation, the State of Franklin and now Tennessee. We proudly celebrate our long tradition of reaching outside the walls of our church. We spoke for the rights of indigenous peoples during colonial times. We actively supported the abolitionist movement before during and after the Civil War. We have long been vocal advocates of Civil Rights for all people regardless of creed, color, religion or sexual preference. If you would like more information regarding our beliefs, practices and theology please read all about our faith at the PC-USA's official website. If you don't get all your questions answer, please feel free to contact us! In a historic congregational meeting Nov. 2, 2014, Eusebia members called to be their first installed pastor in years THE REV. JEAN DAVIDSON. A native of South Knoxville, Ms. Davidson is a U.T. graduate and taught science to middle schoolers, before sensing a call to the ministry and entering Columbia Theological Seminary, Decatur, GA. In addition to serving the Presbytery of East Tennessee as Director of Youth Ministry, she has been an Associate Pastor of congregations in Talledega, AL, Nashville, TN, and Louisville, KY.
With her beloved rescue dog, an Irish Terrier, she lives in Maryville and lists as hobbies hiking, photography, reading, natural history, history, and working with children and youth.